Back in art school the washing machine in our building was far from vibration-free. To avoid having it run wild during it’s wash cycle we ended up tethering it to the wall with a couple of strong bungee cords. We had enough trouble remembering to separate our darks from lights, let alone considering the machine as an inspiration for art. 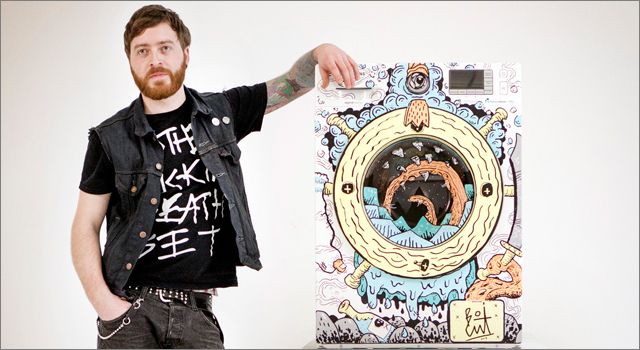 In a new campaign titled ‘Wash & Create’ for Samsung Austria, Vienna-based illustrator Boicut — who has done work for brands such as Nike, Vans, Converse and Hennessey — demonstrates his creativity and steady hand to create an elaborate sea monster-themed illustration using the Vibration-Free washing machine as his canvas. The ad was created by TRAKTOR Wien.